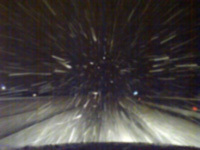 The second ALW this year in Austria took place from 20.-21. October 2007 at the Hutterheim in Innsbruck, in the Tyrol in Western Austria. The venue was the same as 2 years ago when the last � and first � ALW had taken place in Innsbruck. The place is very well suited for such an event, with a large kitchen, a very large hall with a stage and being situated within a short walking distance from the city centre. The latter enables organizers to start the demo where the last workshop ends, without the need to transport large amounts of people across the city. A number of local groups had advertised the event so that, indeed, many people came. Altogether 70 people took part in the workshops! With such numbers, Western Austria is proving to have a well established animal rights movement already! The number of participants is even more impressive considering that winter had arrived the day before, and the streets, especially the motorway, were covered in snow. Nevertheless, all across the West, from Vorarlberg to Salzburg, people travelled to Innsbruck to join in. 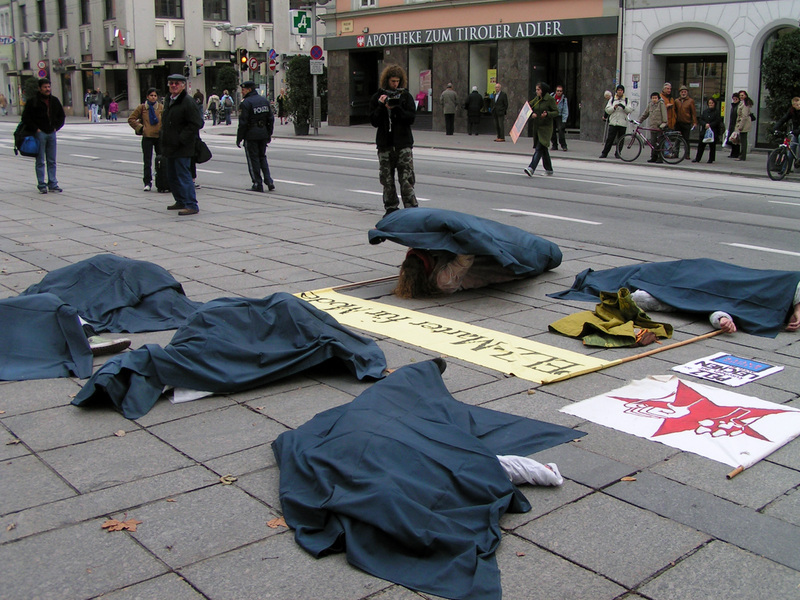 Even 3 activists from nearby Germany took part. On Saturday, the food was provided by local activists for a free donation. They did spaghetti with red and white sauce, as well as a large variety of vegan cream cakes and cookies. On Sunday, the group �food not bombs� supported the ALW with their food. This group gathers vegan food from dumpsters at supermarkets to cook tasty meals, which they provide at public places for anyone hungry for free. 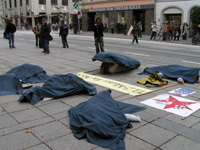 With these actions they protest against commercialism and a wasteful society of luxuries. At the ALW, they had also gathered vegan foodstuff from dumpsters in the morning to prepare soya-burgers with salad for everybody present. Saturday morning, the workshops started with people speaking of their expectations of the ALW. Then a debate followed on whether people today are more inclined to have NGOs act on their behalf than taking on political responsibilities themselves. In the 1980ies, 10.000 people had occupied and successfully protected a primeval forest in Austria against logging for building a power plant. Today it seems unlikely that such a large scale action could take off again. Some argued people might be too complacent today. Others felt that state repression is to blame. A woman born in 1961 said that her children today could never afford being as �naughty� as she was, when she was young, since closed circuit TV and surveillance by authorities would prevent that. Maybe because of that, people feel too intimidated to show civil disobedience against injustices. Some people related problems with their employers because of their completely legal animal rights activism. After a brief introduction into animal rights philosophy, 4 local animal rights groups introduced themselves. Short video clips of actions, mostly produced by VeganTV, illustrated their activism. After lunch, all participants did a demo march criss-crossing through the whole inner city of Innsbruck, which took 4 hours! 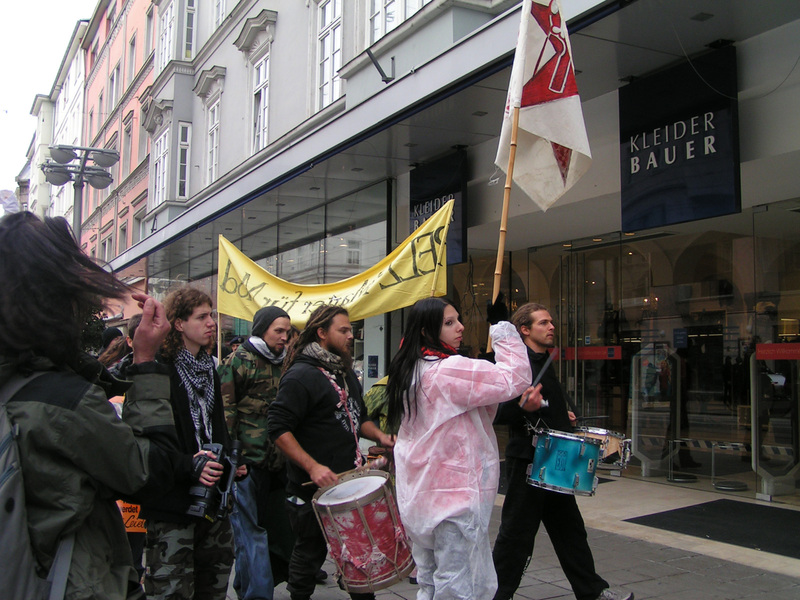 The march stopped in front of countless shops participating in animal abuse, especially Kleider Bauer, which saw a 20 minute demo, and high street shops in the pedestrian area selling fur. 3 outlets of the company Einwaller, which sells a lot of fur, were visited by an angry crowd of protestors, shouting anti-fur slogans, supported by 8 drummers. 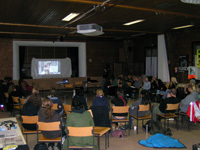 After the demo, back at the Hutterheim, a workshop was held on different forms of activism for animal rights. A local vegan punk band showed their promotion video with a lot of animal abuse footage, and a local artist provided pictures of his animal rights sculptures � all different kinds of activism for animal rights as well. Obviously, demos, occupations and direct action also featured prominently in the workshop. The day ended with animal rights action videos from Finland and Israel. Sunday morning, the day started already at 10 am with the showing of �Jill�s film�, a film on the life of Jill Phipps, an activist killed by a live animal transport lorry during a blockade of Coventry airport in England on 1st February 1995. The sensitively arranged film sequences did not fail to move everybody. Then a talk was given on methods of investigating animal abuse, followed by an introduction of all different animal rights campaigns currently being run in Austria. That was meant to provide an overview to new activists for them to choose with which kind of campaign and which topic they might want to get involved in. 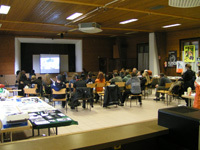 After lunch, a workshop on veganism was held. The reasons for becoming vegan do not rest on ethics alone, but also involve environmentalism, human rights and politics. The talk was supported by a number of videos on the slaughter of free range animals, the gassing of male chicks for egg production and vegan sports stars. 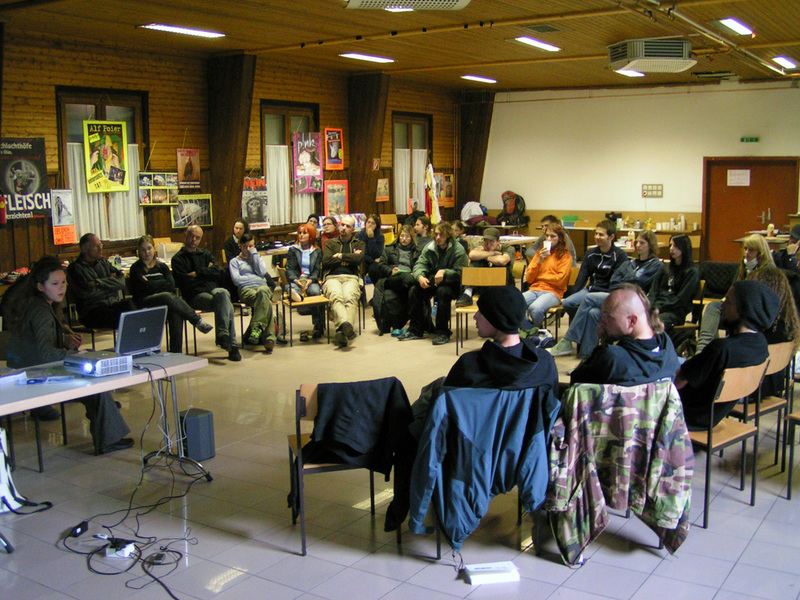 The last workshop was on police repression and citizens� rights. Most people feel intimidated by state authorities and if they do not know their rights, they might unwillingly forfeit them. A number of activists told stories of how police took their rights away and results of court trials were presented. It became clear once again that rights is not a given in society, but rights must be fought for in a continuous battle, even as fundamental rights as the right to protest and the right to free speech. This ALW served to provide people with the basic knowledge and the confidence not to be intimidated by authorities, to stand up to defend the weakest in our society and to resist the constant erosion of fundamental rights and democracy.